#bankerafricaawards Cfc Stanbic bank was named the 'Best Corporate Bank' in kenya during the recently concluded Banker Africa Awards 2016,East Africa. The Standard bank subsidiary came top after being voted as the best in its category flooring big names in the Kenyan banking industry including; Diamond Trust Bank-DTB,I&M Bank,Cooperative bank of kenya,Barclays Bank of kenya and the Kenyan Standard Chartered Bank- Stanchart. 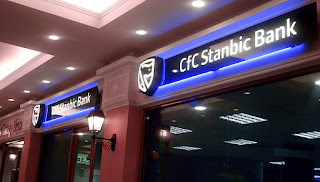 Congratulations for the win ,Cfc Stanbic. In East African category,Standard Chartered Bank was crowned the 'Best corporate bank' after a tough battle with Citi bank,CFC Stanbic bank,Bank M,Barclay's bank and Commercial Bank of Ethiopia.